In the run-up to the presidential and legislative elections of April-June 2012, this blog will look at some of the most interesting departments, profiling their political preferences, past and present. The first department to be profiled is Savoie. When the name Savoie is evoked, the first thing which often comes to mind are ski resorts catering to an affluent clienteles and the beautiful snowy peaks of the Alps associated with skiing. Skiing and l’or blanc, however, is only part of the picture. The political reality of Savoie is rather different, hiding a fairly strong working-class presence and an interesting political evolution. These political profiles will be broken down in a logical manner, from the basics to the details, covering the basic geography of a department, looking at its political institutions (constituencies, general councils, cantons), its general voting patterns and more detailed voting patterns in regards to the large political families. Savoie’s geography is largely dominated by mountains, meaning that the bulk of the department’s 410 thousand inhabitants reside either in the urbanized lowlands around Chambéry or in the valleys surrounded on both sides by mountains. Savoie can be divided fairly easily into four broad geographic regions. The bulk of the population lives in a region known as the combe de Savoie, an valley formed by the confluence of the Arc and Isère rivers. The Isère, which flows southward out of the department towards Grenoble through the Grésivaudan valley, forms a large valley extending all the way to Albertville. But Savoie’s largest city and prefecture, Chambéry, is not technically in the Isère valley. It lies to the south of the Lac du Bourget, and in a valley between the massif des Bauges and the massif de la Chartreuse. Aix-les-Bains, the department’s second largest city, lies on the shore of the Lac du Bourget. To the west, separated from the Chambéry area by the southernmost reaches of the Jura, the avant-pays savoyard is a fairly low-lying or hilly rural region. The combe de Savoie forms the division between the two main mountainous regions of Savoie, each defined by a river valley. The Arc river, which flows south and then east, forms the Maurienne valley. The largest city in the Maurienne valley is Saint-Jean-de-Maurienne, and its economy has traditionally been more dependent on industry than tourism. The Isère river, which continues by flowing south from Albertville to Moûtiers and then eastwards towards Bourg-Saint-Maurice, forms a valley known as the Tarentaise. This region has become heavily defined by ‘white gold’ which has made the riches of ski resorts including Val-d’Isère or Courchevel. The mountain range lying to the north of the Isère is known as the massif de Beaufort. Savoie has been represented by only three deputies since 1945, but following the 2009 Marleix redistricting, Savoie will be electing a fourth deputy in June 2012. It elected four members between 1928 and 1936, and elected five members between 1876 and 1914. The department was redistricted in 1875, 1927, 1958 and 1986. A quick glance at the old (1986-2009) constituency map would give the impression of a fairly decent redistricting. In reality, the constituencies drawn by Charles Pasqua in 1986 were quite awful. The Maurienne has always defined a constituency, which was expanded in 1958 to take in the combe de Savoie around Montmélian, a fair enough compromise forced by population declines in the valley. But the 1986 redistricting split the city of Chambéry, which was probably not necessary, to give the southern and south-western cantons of the city (along with suburban La Ravoire and Cognin) to create an egregious constituency which spanned from the urban core of Chambéry to the remotest, most mountainous regions along the Italian border. The other two constituencies were less reprehensible, with the first constituency centered around Aix but taking in the rest of Chambéry, while the second constituency covered Albertville and the Tarentaise. The 2009 redistricting, in which the department gained a seat due to rapid demographic growth in the Chambéry area, gave a chance to right old wrongs. The most logical option for a new constituency centered around Chambéry would have been one which stretches across the centre-west of the department, from the Bauges to the Chartreuse, thereby taking up the entirety of Chambéry and its suburbs (save La Ravoire) while leaving the less chambérien regions of the Isère valley out of it. The actual result is not the most optimal, though the new fourth constituency does re-unite Chambéry and some of its suburbs, but extends a bit too much to the east to take in the Isère valley cantons of Saint-Pierre-d’Albigny and Grésy-sur-Isère. Still, we can be pleased by a coherent second constituency in the Tarentaise, a purely aixoise first and a less insane third – it still borders on Chambéry, but is less reprehensible. Savoie has returned three right-wing deputies since 1993, as it had between 1958 and 1973. Yet, between 1973 and 1993, with the exception of 1986, Savoie gave the left a 2-1 advantage in its parliamentary representation. Savoie has supplied a fair number of cabinet ministers in the past, including Pierre Cot, Louis Besson, Michel Barnier and Hervé Gaymard. Savoie has two Senators, last renewed in 2004. It has returned one Socialist and one Gaullist to the Senate since 1995. Savoie’s general council has 37 members. Governed by the right since 1982, the right found itself tied with the left in 2011, and the incumbent president of the general council, former cabinet minister and deputy Hervé Gaymard (UMP) was reelected in a tied vote against PS Senator Thierry Repentin thanks to seniority. Savoie has relatively few cantons (37), which partly explains why it is fairly easy for it to switch in a wave election. There are, of course, major population disparities, between 2,604 people in mountainous Lanslebourg-Mont-Cenis and 15,000 in most of the urban cantons of Chambéry and Aix (and 20,207 in La Ravoire), but this is nothing which cannot be seen elsewhere in France. Savoie has 11 members of the regional council. The left won 7 in 2011, split between 4 PS and 3 Greens, while the UMP won 3 seats and the FN 2. Savoie generally leans to the right in most elections. In 2007, Nicolas Sarkozy (UMP) won 57.32% of the vote against 42.68% for Ségolène Royal (PS). The three constituencies taken as wholes do not show significant differences from one to the other, and Sarkozy won all three constituencies by similar margins – but he failed to break 60% in any one of them. The last left-wing candidate to win Savoie was François Mitterrand in the landslide of 1988, when he won 50.18% of the vote against 49.82% for Jacques Chirac (RPR). This gives the impression of a long-time right-wing stronghold, but digging deeper, we find that Mitterrand won Savoie in the much narrower left-wing victory of 1981 with 50.45%. Savoie was 4.3% more right-wing than the national average in 2007, and 3.8% more right-wing than the national average in 1988. But in 1974, Savoie was more evenly divided: it was 0.03% more left-wing than the national average and in 1965 it was a full 0.6% to the left of France, giving Mitterrand a fairly strong 46.07% of the vote against Charles de Gaulle. On April 22, 2007; Savoie gave Sarkozy 33% of the vote, about 2% more than what he won nationally. Royal won 21.8%, against 25.9% nationally. François Bayrou (UDF) outperformed his national result in Savoie, with 20.1% against 18.6% nationally. Jean-Marie Le Pen, with 10.75%, barely outperformed his paltry national result of 10.4%. In 2002, however, Le Pen had prevailed over Chirac in the first round, with 19.8% (some 3% more than what he won nationally) against 18% for Chirac and only 13.1% for Lionel Jospin (PS) who did 3% worst than in the rest of the country. In 1995, Edouard Balladur won the right-wing matchup against Chirac in Savoie, with 20.3% against 18.7% for Chirac. In the 2009 European elections, the UMP won 29.2% (slightly more than what it won nationally), while the Greens placed second with 19.9% – outperforming their national record of 16.3%. The PS, which won 16.5% nationally, won 14.5% in Savoie. The centre (8.1%) and the FN (6.6%) about matched their national results. In the 2010 regional elections, the UMP won 26.8% in the first round (against 26.4% region-wide) while the PS won 25.3% and the Greens won 19.1% (against 17.8% region-wide). The FN won 12.7%, less than the 14% it won in the region. In the runoff, Jean-Jack Queyranne’s left-wing coalition won 51.2% (a bit more than the 50.8% it won in the region as a whole) against 34.7% for the UMP and 14.1% for the FN (slightly less than in the region). Savoie’s general political inclination can be summarized as being traditionally right-leaning, with a major far-right presence; while the left, progressively weakened in presidential elections, has a fairly significant Green component. In France, besides the usual class/income indicators, two other indicators can usually tell us a fair bit about the bases of a region’s political traditions: clericalism and the type of farming. Savoie, unlike Haute-Savoie, is not a particularly clerical save for Lanslebourg-Mont-Cenis in the Haute-Maurienne. At the same time, Savoie is not either de-christianized land like parts of the Southwest and Limousin. It is not really anti-clerical in the aggressive, activist sense of the term, all while not being clerical either. Church attendance is good, but like in parts of Brittany or Normandy, the clergy’s political influence was limited and church-goers acted in independence from church actors. The second indicator, less obvious to most observers, is that of the ‘type of farming’ or basically how the land was exploited: by sharecroppers, by tenant farmers or by owners who worked the land themselves. Like most mountainous regions, Savoie is a land of smallholders (so-called petite propriété). In 1942, 93% of the land in Savoie was directly worked and exploited by the owners themselves. For geographic regions, mountains and small valleys are hardly suitable for the larger properties which lead to sharecropping or tenant farming, both of which were all but absent from Savoie (1% and 6% respectively in 1942). The political implications of this should not be downplayed. Smallholders, especially those in mountainous regions, have tended to be the standard-bearers of the republic against reaction. Mountain villages and their inhabitants, living together in fairly nucleated environments, were more likely to live in a more homogeneous society lacking strict social hierarchy or classes. The savoyard right finds its strongest support in the Tarentaise. In a distant past, there was likely a strong element of agrarian rural conservatism to this strength, and it can still be found in parts of Lanslebourg-Mont-Cenis, but the Tarentaise is nowadays driven by ski resorts – the famous white gold. The major ski resorts in the department include Les Trois Vallées (Courchevel, Val Thorens, Méribel); Paradiski (La Plagne, Les Arcs in Bourg-Saint-Maurice, Peisey-Vallandry); the prestigious Espace Killy (Tignes, Val d’Isère); and the Espace Diamant (Flumet, Notre-Dame-de-Bellecombe, near Ugine and Megève). There are also more remote ski resorts in Valloire, Valmeinier (in the Maurienne) and Val Cenis. Ski resorts in the United States and Canada are famously allergic to conservatism, and the American equivalents of Courchevel or Val d’Isère in Colorado are Democratic strongholds. On the other hand, ski resorts in France and the rest of the Alps are strongly right-wing. Little actual research has been done, as far as I know, on this topic, but one of the main differences advanced is that skiing tends to attract a younger and more left-liberal clientele in the Americas (ski bums?) while attracting a middle-age, affluent conservative clientele in France and Europe. Certainly the ski resorts in France are generally quite affluent (especially the ‘prestigious’ ones), and there are a whole lot of secondary residences in those communes. It is doubtful, however, that people who own second homes there would vote there during presidential elections in May. The people who actually vote there are probably employed by the ski resorts or are people who live there year-round. Whatever the cause of the conservatism of the French ski resorts, it is extremely pronounced and significant. Nicolas Sarkozy won 60% in the larger city of Bourg-Saint-Maurice, but won 79.6% in Saint-Bon-Tarentaise (Courchevel), 79.6% in Val-d’Isère, 66% in Tignes, 76% in Les Allues (Méribel), 73% in Saint-Martin-de-Belleville (Val Thorens), 70% in Valloire, 76.9% in Flumet, 75.7% in Notre-Dame-de-Bellecombe, 71% in Lanslebourg-Mont-Cenis and 64.7% in Saint-Jean-d’Arves. In 2010, when the UMP in Savoie basically found itself confined to the ski hills, it still won some comparatively huge results in the vast majority of the ski resorts: 70% in Val-d’Isère, 61% in Saint-Bon-Tarentaise, 58% in Les Allues, 59% in Saint-Martin-de-Belleville, 58% in Lanslebourg-Mont-Cenis, 53% in Flumet or 49.7% in Valloire. The growth of ski resorts and their right-wing voting habits is the first major cause of the shift to the right in Savoie. In ‘rural’ mountainous Savoie, it has replaced agriculture (largely sheep herding or cattle grazing) or declining light manufacturing as the top employer. The Maurienne, with a few exceptions (Valloire or Saint-Jean-d’Arves) has not profited as much as the Tarentaise from the ski resorts. The Maurienne has traditionally been a fairly working-class region. The industrial base is fairly diverse, ranging from iron ore mines in Saint-Georges-des-Hurtières to a small chemical industry in La Chambre to light manufacturing activities in La Rochette to aluminium in Saint-Jean-de-Maurienne to hydroelectric power (la houille blanche) and paper mills around the cité cheminote (a fairly common type of working-class city in France, driven by rail depots or famously left-wing railroad workers) of Modane. But the industrial base of the Maurienne has been in stark decline in recent years, and the region has been aging rather quickly. A RioTinto-Alcan aluminium plant in Saint-Jean-de-Maurienne is threatened with closing. Traditionally left-wing, the Maurienne has increasingly flirted with the right and far-right in recent years. The left has retained a hold on a number of smaller working-class villages in the valley, including Fourneaux, Saint-Etienne-de-Cuines and Arvillard, but Nicolas Sarkozy still performed rather well in the Maurienne for a right-wing candidate. He won Saint-Jean-de-Maurienne (56.6%) and La Chambre (59.3%), but both hade preferred Chirac in 1995 as well. He lost Fourneaux, an historic left-wing stronghold, but his 48% were better than Chirac’s 44.9% in 1995. In Saint-Georges-des-Hurtières, a PCF stronghold, he won only 40% but still won 5% more than Chirac in 1995. An aging population, industrial decline and the growth of ski resorts explains the left’s decline in this region. At a local level, the right ended over 40 years of left-wing dominance in the canton of Saint-Jean-de-Maurienne in 2001 and in 2008, the UMP took the town from the left. La Chambre is still ruled by the right and until 2011 the canton was, since 1985, the preserve of right-wing power broker Daniel Dufreney (CNIP) despite having been a PS-PCF battleground since the Liberation. The canton of Aiguebelle, a PCF stronghold, has remained far more resistant, having been held by the PCF, very much dominant in the iron ore mining town of Saint-Georges-d’Hurtières (Robert Hue won it in 2002! ), since 1976. 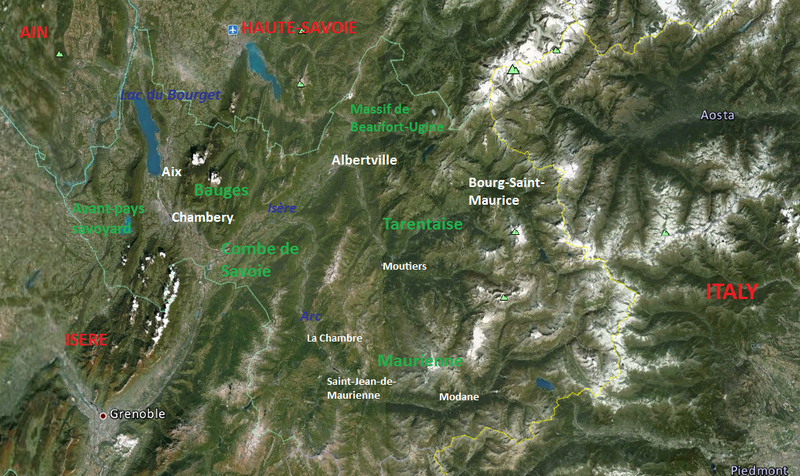 The combe de Savoie and the Tarentaise valley south of Albertville also has its share of working-class areas. I don’t know much about the details of its industrial base, but the railroad from Grenoble likely plays a role in the whereabouts of Montmélian while there is some light manufacturing or random factories, timber mills or railroad depots in working-class areas to the south of Albertville in the Tarentaise (La Bâthie, Cevins, La Léchère, Grignon, Esserts-Blay, Saint-Marcel). Royal performed fairly well in the working-class areas of the Tarentaise, but in 1995, Lionel Jospin had performed strongest in a cohesive chain of towns in the Isère valley, but in 2007, Sarkozy had in good part broken that chain, save a few towns around Montmélian and south of Albertville. Albertville is a fairly affluent middle-class community with a strong manufacturing base. It voted 54.7% for Sarkozy, but in 1995 it had given Chirac nearly 56% of the vote. Albertville has been shifting to the left in recent years, like the bulk of similarly well-off middle-class professional urban areas in France. In 2008, the PS ended decades of right-wing dominance in the city with a surprise victory over an incumbent UMP mayor. The left won 52% of the vote in the 2010 regional elections. Albertville’s more affluent suburban communities to the north are traditionally strongly right-leaning. The urban influence of the cities of Albertville and Chambéry has extended in recent years to basically merge the greater influence circles of both cities, transforming the bulk of the Isère valley into lower middle-class suburban or proto-suburban territory with fairly strong and sustained demographic growth. This type of socio-demographic evolution, périurbanisation, is generally politically favourable to the right and especially the FN. In 2007, Nicolas Sarkozy proved a particularly good candidate for those types of growing middle-class proto-suburbs. It might serve to explain why he broke the left’s old coherent chain of support in the combe de Savoie. Albertville lies at the confluence of four valleys, including the val d’Arly, a smaller valley smacked between the Bauges and the Beaufortin. The main population centre is Ugine, an industrial city driven by a declining steel industry. Historically one of the left’s main strongholds in Savoie, Ugine and its region has suffered from economic decline and transformations (towards ski resorts in nearby Flumet), and it is no longer the Socialist or Communist stronghold of yesteryear. Lionel Jospin had won 50.3% of the vote in Ugine in 1995, Sarkozy won 55%. It has been governed since 1995 by the right, after having been governed by the left or PCF since 1908. Chambéry, the largest city and political centre of Savoie, has a weaker and more recent industrial base than other cities. Historically, its economy was largely based around public administration and the military, with its industrial activities (textile, glass, light manufacturing, factories) being more recent. It is a cosmopolitan urban core, with a sizable foreign-born population (largely Italian) and a large student population thanks to a local university. Politically, Chambéry has traditionally leaned to the right, but it has seen a significant shift to the left in recent years. Governed by the right for decades save the 1977-1983 period, PS deputy Louis Besson was elected mayor by the first round in 1989. After a narrow reelection in 2001, he retired in 2007 in favour of Bernadette Laclais, a young regional councillor, who was reelected in a cakewalk by the first round in 2008. In 1995, Chambéry gave Chirac 53.8% of the vote, but in 2007, Sarkozy lost the city by a hair winning 49.4% of the vote. The city’s clear left-wing inclination was further confirmed in 2010, when the left won 58% of the vote against a paltry 32% for the UMP. But the left in Chambéry, fairly obviously, has a strong Green component: the Greens won 22% of the vote in Chambéry in 2009, against barely 17% for the PS. As the traditionally working-class parts of the department shift towards the right, at least until 2007, the more cosmopolitan middle-class urbanized areas of Chambéry and its immediate surroundings are shifting towards the left. Save for the less affluent inner suburb of Cognin, Chambéry’s larger suburban communities are largely affluent and right-leaning. Sarkozy won 62% in affluent La Motte-Servolex, 61% in Sonnaz, 58% in Barberaz, 57% in La Ravoire and 57% in Saint-Alban-Leysse. He also won 59% in affluent Bourget-du-Lac, less suburban and driven largely by tourism and with a sizable student population. We might be seeing a slight shift to the left in Chambéry’s inner suburbs, including La Ravoire or Jacob-Bellecombette which has a large student population. Chirac had taken 57% in Jacob-Bellecombette, Sarkozy took only 53% and the Greens did really well in 2009. The communities which line the Lac du Bourget are all, with a few exceptions, very affluent, a common element for most towns clustered along a small inland lake. Most prominent of these communities is Aix-les-Bains, the department’s second largest city. Affluent, Aix-les-Bain has historically been marked by thermalisme or hydrotherapy. Like the bulk of these French cities with hot springs and spas, it has historically attracted a fortunate, very well-off clientele. Aix is the main right-wing stronghold in western Savoie. Sarkozy won 62%, about the same as Chirac’s 63.5% in 1995. Between 1969 and 1985 and again between 1995 and 2001, Aix was the stronghold of RPR strongman André Grosjean. Political battles at the local level have often opposed the various factions of the right. Grosjean, defeated by UDF deputy Gratien Ferrari in 1989, in turn defeated Ferrari in 1995 before being defeated again in 2001 by DL deputy Dominique Dord, easily reelected in 2008 with 63% while Ferrari won only 9.6%. Other affluent lakeside communities such as Tresserve (70% Sarkozy), Bourdeau (69%), Brison-Saint-Innocent (62%) or Conjux (60%) have been strongly right-wing in recent years. The avant-pays savoyard, separated from the separated from the Chambéry area by the southernmost reaches of the Jura, is a largely rural area with small population centres (Yenne, Le Pont-de-Beauvoisin, Saint-Genix-sur-Guiers) concentrated along the rivers which define the department’s boundaries with the Ain and Isère. These towns seem fairly working-class areas, with old declining cités cheminotes such as Saint-Genix or Saint-Béron or larger light manufacturing centres such as Le Pont-de-Beauvoisin. The working-class traditions of these areas are largely historical facts nowadays, as they appear to be poorer areas attracted towards larger middle-sized population poles (Belley, La Tour-du-Pin, Voiron or Chambéry-Aix) by the process of périurbanisation. Some communes lying closer to Chambéry-Aix and connected by a highway to the main population conglomerations of the valley or across the border in Nord-Isère have become suburban or exurban communities, though not as affluent as the older suburbs. In political terms, some of the older working-class areas had a rather strong left-wing tradition – Le Pont-de-Beauvoisin was a PCF stronghold of sorts for quite some time – but there has been a strong shift to the right in recent years. Nicolas Sarkozy performed well both in affluent proto-suburbs such as Novalaise (60%), lower middle-class exurbs such as Saint-Paul or Saint-Jean-de-Chevelu (59%) and non-suburban population centres with a working-class past such as Le Pont-de-Beauvoisin (56%), Saint-Béron (57.5%), Saint-Genix (62.6%), Saint-Christophe (63%) and Yenne (63%). Chirac, in 1995, had done about as well or even better than Sarkozy in places like Novalaise but Sarkozy outperformed him most in the non-suburban population centres or lower middle-class exurbs. In 1992, Savoie voted oui to Maastricht with 54% (51% nationally) and in 2005 it voted non to the TCE with 51.4% (55% nationally). Slightly more pro-European than average, these two EU referendums are instructive on their own given the fairly stark class patterns they exhibited. In 1992, the no was triumphant only in the Maurienne (save Saint-Jean), Ugine and parts of the combe and avant-pays. Put simply, working-class areas proved resistant, as did lower middle-class exurbs. The ski resorts were more reserved in their yes votes, likely the impact of a certain reticence by some right-wingers to vote oui to a referendum supported by Mitterrand and the PS as well. But support was high in the urban area of Chambéry-Aix, where affluent and middle-class urbanites confirmed their pro-European inclinations. In 2005, the oui was dominant in the ski resort cantons in the mountains and again in the Chambéry-Aix agglomeration. Ski resorts embraced the oui wholeheartedly, as did most affluent right-wing strongholds across France, while urban areas remained favourably predisposed towards the constitution. Once again, the Maurienne (especially PCF stronghold Aiguebelle) proved the most most Eurosceptic region. Abstention is about at the national average in Savoie, sometimes above average or below average (as in the 2007 presidential election). It follows the national patterns closely, to highs such as 56.5% abstention in the first round of the regionals in 2010 or lows or 13.8% abstention in the first round of the 2007 election. As is usual in most of France, it is higher in mountainous areas for reasons of remoteness and in urban areas. Rural areas around Chambéry-Aix have tended to turn out in higher numbers, as have parts of the Isère valley. Savoie has had a major far-right presence for the past twenty or so years, peaking at 19.8% of the vote for Jean-Marie Le Pen on April 21, 2002. Since then, the FN’s performance in Savoie has been far less impressive. Le Pen outperformed his national result by only a few decimals in 2007 and the FN’s 2010 result in Savoie, 14%, was not particularly spectacular. Furthermore, the FN has never really had the institutional impact it had in PACA or even other parts of Rhône-Alpes. The 2002 cantonal map is rather interesting. Jean-Marie Le Pen dominated the Maurienne, the combe, the Albertville-Ugine valleys and most of western Savoie including the avant-pays. Jacques Chirac, on the other hand, was victorious in the urban centres of Chambéry, Albertville, the ski-driven Tarentaise, affluent La Motte and rural mountainous Le Châtelard. In the Maurienne, parts of the combe and Albertville-Ugine, Le Pen’s electorate was probably more working-class. He won 24% in Ugine, 27% in Grignon, 22% in La Chambre, 21% in Saint-Jean-de-Maurienne and 25% in Saint-Michel-de-Maurienne. At a more macro cantonal level, his best result was 24.5% in the canton of La Rochette, a small mixed valley-hills/mountain canton with a proletarian tradition. He won 24% in Ugine, boosted both by industrial Ugine and the conservative rural-small resorts of the mountains. He did similarly well in the Maurienne’s cantons, including 21% in Aiguebelle (but he did rather poorly in the PCF stronghold of Saint-Georges-des-Hurtières), 23% in La Chambre and 22% in Saint-Jean-de-Maurienne. Some of the frontiste vote there in 2002 was probably of the gaucho-lepénisme variant, but in the core left-wing strongholds, Le Pen did rather poorly. 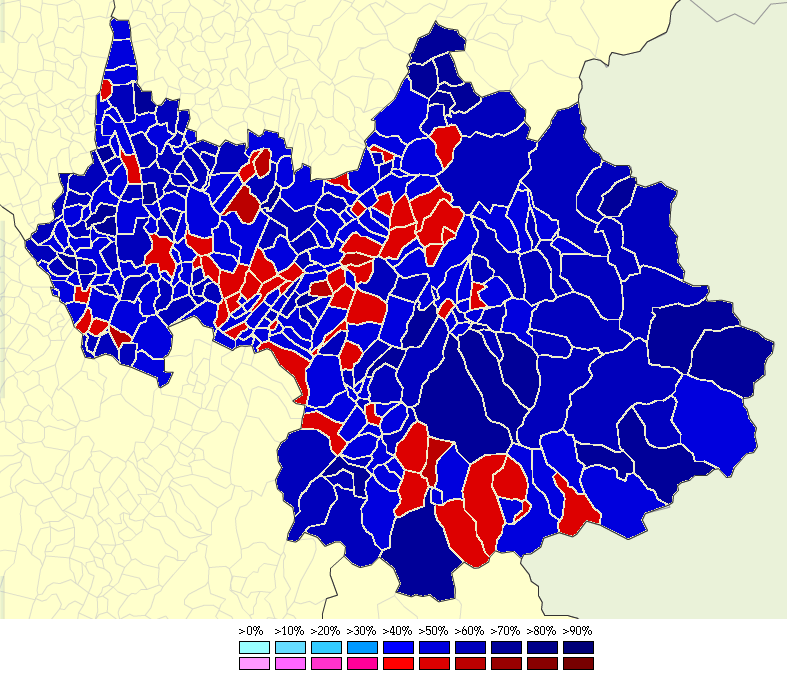 In parts of the Isère valley but also in most of the avant-pays savoyard, Jean-Marie Le Pen’s vote was likely more périurbain – lower middle-class exurban or outer suburban with a working-class past. This is basically the type 1-bis FN vote I described in an earlier post on the Le Pen collapse of 2007. As with most type 1-bis areas, the avant-pays or Isère valley is not particularly poor and unemployment tends to be below average, but there is a strong law-and-order/nationalist populist-conservative element in these areas. The proximity to urban areas (Chambéry, Grenoble, Annecy, Nord-Isère and Lyon) which concentrate the “liberal elites” and large immigrant/foreign-born populations also provides a natural boost to the FN vote. Again working at a cantonal level, Le Pen won 22% in Les Echelles, 21% in Le Pont-de-Beauvoisin, 21% in Yenne and 22% in Albens, but also 22% in Saint-Pierre-d’Albigny and 20.5% in Chamoux-sur-Gelon. At a communal level in some communes used as examples earlier, Le Pen won 29.7% in Saint-Christophe-sur-Guiers, 28% in Saint-Béron and 24% in Le Pont-de-Beauvoisin (commune). His vote in the valley around the lake and Chambéry was not as high (17-20%) but he did take 22% in Aix and 27% in Voglans (a suburb of Chambéry). Jean-Marie Le Pen lost 9.04% of his 2002 support in 2007. In reverse, Nicolas Sarkozy did 9% better than Chirac-Boutin-Madelin had done in 2002. As in most of Rhône-Alpes and PACA with similar concentrations of type 1/type 1-bis FN voters, Nicolas Sarkozy was very successful in attracting the votes of these voters whose FN was not quite the anti-system protest vote cast by the more working-class FN voters in the north of France. Again, our three fairly homogeneous constituencies do not show wide disparities in the FN change from 2002 to 2007, but Le Pen’s heaviest loss (-9.44%) was in the first constituency (the avant-pays, Aix, Chambéry centre). In 2010, the FN’s results hardly matched the successes registered by Le Pen in 2002, but the bases were largely similar. Strongest support was in the avant-pays savoyard where type 1-bis voters have returned to the FN fold: 19% in Yenne, 18% in Les Echelles and 16.5% in Le Pont-de-Beauvoisin. In the Maurienne, the FN won 18% in Saint-Michel, 15% in Saint-Jean, 16% in La Chambre and 16.3% in La Rochette. The FN took 16% in Ugine and 17.6% in Albertville-Sud. Results in the urban agglomerations were weak: 10% in Chambéry, 11.6% in Cognin, 13.5% in La Ravoire and 12% in La Motte-Servolex. In the 2009 European elections, the Greens took 19.9% in Savoie and still won 19% in the 2010 regionals. It placed a distant second ahead of the PS, generally outpolling the PS in most of the department’s communes. Fairly obviously, the Greens performed weakest in the working-class Maurienne and parts of the combe near Albertville. It performed very strongly in the Chambéry metro, taking 22% in the city itself and between 18 and 30% in the bulk of the surrounding communities including 26% in Jacob-Bellecombette, 22% in Le Bourget-du-Lac and 19% in Aix. It also performed fairly strongly – in some cases very strongly – in areas which we can think of as rural or suburban (24% in Le Châtelard, a rural area largely in the Bauges mountains). In those cases, it likely took traditional PS voters but perhaps some younger bobo-types who moved to villages in the mountains or voters concerned by environmental issues (likely a major reason in explaining Savoie’s natural strong greenie inclination). In the Tarentaise, the Greens did rather well, save for the very affluent ski resorts like Val-d’Isère, taking 24% in the canton of Bourg-Saint-Maurice or 22% in Aime. The correlation is not entirely there, but in good part the Green map looks like a mirror (reverse) image of the FN vote, with weak performances in the Maurienne and the borders where the FN performs well. Savoie is not as receptive to centrist candidates of the Christian democratic family as Haute-Savoie is, largely because it is far less clerical than Haute-Savoie. The UDF was never particularly strong in Savoie, though Albertville’s constituency did elect Joseph Fontanet, a long-time MRP bigwig and cabinet minister, between 1956 and 1973. In 1995, Edouard Balladur, whose support was in most cases reflective of that of the UDF, outpolled Jacques Chirac in Savoie, a result perhaps more reflective of Savoie’s more liberal variant of right-wing politics which was represented by Balladur over the more populist Chirac. In 2007, François Bayrou won 20.07% of the vote in Savoie, above his national average. Again, this result is perhaps more reflective of Bayrou’s strong appeal to moderate right-wing voters (of which there are quite a few in Savoie, despite the appearance the strong FN vote creates) of a more social liberal/liberal variant. Bayrou’s support in Savoie was in good part concentrated in the Chambéry-Aix basin. He won 21.3% in Chambéry and 20.6% in Aix. At a cantonal level, Bayrou achieved 23% support in La Ravoire, 22% in La Motte, 23% in Aix-Nord, 21.4% in Cognin, 23% in Albens and 22% in Albertville-Nord. Bayrou’s strong support in 2007 has hardly translated into a strong base of support for the MoDem since then. At a cantonal level, it holds only Cognin. The PCF’s results in Savoie have traditionally been very close to the national average. In 1995, Robert Hue won 7.94% of the vote. More recently, the FG won 5.5% in 2009 and 6.6% in 2010. The PCF is left with only a single seat in the general council, its old stronghold of Aiguebelle which it has held since 1976, joined in 2011 by a gain by the PG in La Chambre. At a local level, the PCF is weak in large urban centres but maintains a fairly sizable local infrastructure in rural areas. As previously noted, the small iron ore mining village Saint-Georges-des-Hurtières is a rock-ribbed PCF stronghold. Like most of those few remaining ancestrally Communist cantons in France, Aiguebelle often continues to give the PCF some nice results in elections to most other levels. In 2009, the FG placed second in the canton of Aiguebelle and first in Saint-Georges-des-Hurtières. In 2010, it gave 20% of the vote to the FG (and 50.3% in Saint-Georges). Saint-Georges-des-Hurtières still votes for the PCF in levels which they haven’t seen elsewhere since the 1950s. It gave 19% of the vote to Marie-George Buffet in 2007! Elsewhere, the PCF’s support is largely defined by the industrial or working-class areas in the Isère valley and the Tarentaise from Albertville to Moûtiers. In 2010, the FG won 13% in Albertville-Sud (which includes some PCF strongholds such as Cevins, 27% of the vote), 10% in Chamoux-sur-Gelon, 10% in Ugine (14% in Ugine proper) and 9.6% in Moûtiers. The PCF also retains a smaller foothold in its old strongholds in the avant-pays. In the Maurienne, where the PCF used to have a much stronger footing in the 1970s, the PCF can still poll fairly well, usually in its strongholds such as Saint-Etienne-de-Cuines (12% in 2010). Savoie, which became French only on the late, was traditionally republican during the early days of the Third Republic. In 1871, when the rest of France voted for peace and the monarchists, Savoie narrowly elected a majority of republicans (3-2) to the National Assembly. In the years which followed, Savoie’s single-member constituencies never once elected an anti-republican (monarchist, Bonapartist, nationalist) deputy. It usually preferred moderate opportunist republicans, until 1902 when it started voting Radical (Albertville elected a Catholic rallié). Thus, in the latter parts of the Third Republic, Savoie became a Radical stronghold. In 1906 and 1928, it returned only Radicals. Like Champagne or Eure-et-Loir, Savoie’s radicalism was of the centrist variety, a Radical vote which expressed the republicanism but also the fairly conservative views of smallholders who owned their land rather than a left-wing vote expressing anti-clericalism or anti-system protest. As such, the PRG has had basically no major impact in Savoie and its base is non-existent besides one general councillor. In 1936, the arrondissement of Chambéry returned two Radicals, including the fairly left-wing ‘Young Turk’ Pierre Cot, while Moûtiers reelected Ugine mayor André Pringolliet (an ex-Socialist, now standing under the ‘republican-socialist’ etiquette). Saint-Jean-de-Maurienne ousted its right-leaning Radical incumbent in favour of a SFIO candidate who was elected on the votes of Aiguebelle, La Chambre and Saint-Jean. In the post-war years, Savoie elected two Communists (including Pierre Cot, who, while not technically a Communist, affiliated with the PCF) in 1946. But in both those cases, the success was more the result of a common left-wing slate, led by Pierre Cot. The right was dominated by Joseph Delachenal, who had already been elected back in 1910 and 1919. In the 1951 and 1956 elections, in which the PCF stood on its own, it found the bulk of its support in the Maurienne valley (especially La Chambre, Saint-Jean, La Rochette, Aiguebelle) but also Moûtiers, Albertville and Ugine. The right usually dominated the mountains and the west. Between 1958 and 1973, Savoie was dominated by the right, though by its three families. Joseph Fontanet, a prominent centrist (MRP, later CD) figure and oftentimes a cabinet minister, dominated the Tarentaise and Albertville. Jean Delachenal, the son of Joseph Delachenal and a member of the CNIP and later a giscardien, dominated the constituency centered around Chambéry and Aix. Finally, the Maurienne was dominated by Pierre Dumas, the young Gaullist mayor of Chambéry (1959-1977, 1983-1989). In 1973, Savoie elected two PS deputies: Louis Besson in Chambéry-Aix and Jean-Pierre Cot in the Maurienne. Only Fontanet survived, but in 1974, Fontanet (trying to return to his old seat after leaving cabinet) was defeated in a by-election by a PS candidate, Maurice Blanc, who would be the only Socialist to represent Albertville. In 1978, Michel Barnier, a young RPR leader, defeated Blanc in the Tarentaise, but Besson and Cot were reelected in narrow contests. In 1981, however, all three were reelected by large margins. In 1986, through PR, Savoie elected two right-wingers: Barnier and Gratien Ferrari (UDF), leaving Louis Besson in the third seat. In 1988, the PS’ Roger Rinchet was elected in Saint-Jean-de-Maurienne, while Besson and Barnier returned to their old seats. In 1993, Gratien Ferrari (UDF) was hindered in his quest to defeat Besson’s PS right-hand man Jean-Paul Calloud by the candidacy of the RPR’s Jean-Pierre Vial, although he was ultimately successful. In 1997, Dominique Dord (UDF-DL) was elected fairly easily in Ferrari’s old constituency of Chambéry-Aix. In the Maurienne, the RPR’s Michel Bouvard faced a tougher race but won by 1400 votes. In Albertville, Hervé Gaymard (RPR) was elected by a fairly anemic margin in the safest seat for the right. In 2002 and 2007, all three incumbents won fairly simple reelections. In 2007, only Bouvard struggled a bit against the PS mayor of Chambéry, Bernadette Laclais. In 2012, Laclais is likely in good shape to win the fairly left-leaning new fourth constituency centered around her base of Chambéry. It could also be in a strong position to take the third constituency. Posted on February 26, 2012, in Electoral analysis, Regional analysis. Bookmark the permalink. 3 Comments. As you know, it’s a place I somewhat know personally (even though this knowledge is limited to the Chambéry-Aix-Lac du Bourget region). That’s why I was so interested in understanding its political leanings better. I knew the département overall was fairly right-wing, with FN and greens overperforming their national average, but not much more. So, it was great to learn about intra-départemental geographic divides and their different voting patterns, basically Savoie’s polititical sub-entities. This is also an interesting case study for the evolution of different electorates, with left-wing decline in the industrial areas (I didn’t even know Savoie had ever had industries :P) and rise in middle-class urban centers like Chambéry. And you even managed to cite Brison-Saint-Innocent ! 🙂 Though only to say it was a Sarko stronghold… 😛 What I liked the most is, however, your final section concerning legislative results, with such a fantastic map going back to 1871 ! All the maps in this post were nice, but this one really amazed me. Where did you find so much data by constituency ? If you have it for every département this would have great potentialities. These sub-maps make however easier to look at details which would otherwise be nice to notice. Anyways, this is an extremely promising beginning and I hope you will keep this series going ! Any comment on the recent election, particularly referring to any impact of the controversial Lyon-Turin high speed rail proposal?